From the moment Mary Poppins arrives at Number Seventeen Cherry-Tree Lane, everyday life at the Banks house is forever changed. Jane, Michael, and the twins have never had such a wonderful nanny, who brings enchantment and excitement everywhere she goes. 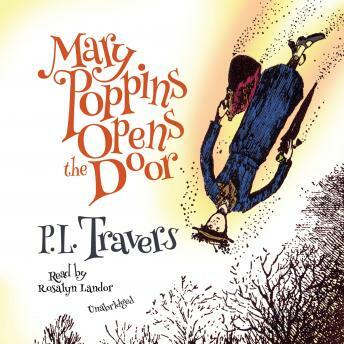 In Mary Poppins Opens the Door, Mary Poppins reappears just in time! According to her tape measure, Jane and Michael have grown “Worse and Worse” since she went away. But the children won’t have time to be naughty with all that Mary has planned for them. A visit to Mr. Twigley’s music box–filled attic, an encounter with the Marble Boy, and a ride on Miss Calico’s enchanted candy canes are all part of an average day out with everyone’s favorite nanny.